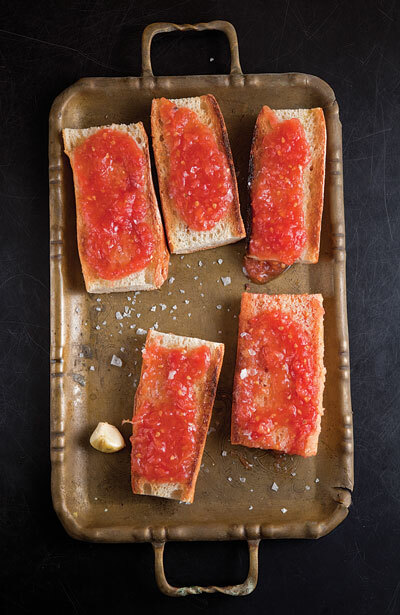 A lovely French woman recently taught me about a simple Spanish snack – Pan con Tomate (bread with tomato). It’s exactly what it sounds like: a thinly sliced baguette topped with tomato. But the trick is that you don’t use tomato slices – you use tomato pulp. You can get fancy and use a box grater on the meat of a fresh tomato (as in the above-linked Saveur recipe), or you could do as my French friend did – just cut a tomato in half and squeeze it onto your bread. For the full effect, start by rubbing the baguette (toasted or not) with a raw clove of garlic, and perhaps a swipe of good olive oil. Press your tomato half on the bread while you squeeze the juicy innards outward, and top with some sea salt. This is one of those simple, perfect things in life. Voila.